The use of a trailer dolly assists with your efforts of maneuvering a trailer around the boat yard or its storage location. There are many heavy duty trailer dollies but for boats, kayaks and other water applications, the extra weight capacity is not required. The best boat trailer dolly is the Tow Tuff Adjustable, which features two 12 inches wheels with a swivel caster and has a weight capacity of 800 LBS. Navigating your boat trailer into tight spaces on your own is quite difficult and cannot be done with your vehicle. The use of a trailer dolly for a boat trailer simplifies the movement within a tight space and makes its far easier. 7.2 How Does A Motorized Trailer Dolly Work? The boat trailer dolly comes in a range of different types that vary depending upon your budget. The most popular are the cost effective manual type that can handle weights of around 1,000 LBS. However, if you have a rather large budget, there are some great motorized trailer dolly alternatives for large loads. Not everyone has the benefit of having multiple people to help move a trailer and this make trailer dollies a great investment. Below is a list of the best trailer dollies that are ideal for moving around a boat trailer with ease. The HD Dolly by Tow Tuff is a unique three wheel trailer dolly that is height adjustable from 21 to 33 inches. It is by far the most popular among boat owners due to its affordable price and ideal weight capacity of 1,000 LBS. Overall, it is the best trailer dolly for boats and other application with it ticking every box in terms of boating. However, the Tow Tuff HD Adjustable Trailer Dolly is not exactly cheap but this is overpowered by the benefits. For those looking for something special, the Trailer Valet XL is a motorized trailer dolly that uses a drill attachment to get things moving. It is capable of handling trailers with a gross weight capacity of 10,000 LBS, which is very impressive. Using your vehicle to move your large vessel is fairly difficult and made worse when you need to move it into a tight space. The Trailer Valet XL is a premium motorized trailer dolly that is ideal for large vessels but does come with an expensive price tag. The MaxxHaul is a cheaper alternative to the Tow Tuff model shown above and is by far the most popular boat trailer dolly. It features a two wheel design and is capable of moving trailers that are up to 600 LBS in gross weight. Overall, the MaxxHaull 70225 is the best trailer dolly for the money with a heavy duty construction that is built to last. It does require assembly from the box but it is very easy to do with less than 10 parts to put together. The Giantex is the cheapest boat trailer dolly within this article but still features everything you will find on premium alternatives. From pneumatic tires that run smoothly on all terrains to an extra long handle. For those on a tight budget and are looking for a low cost trailer dolly, the Giantex is a great example of what can be bought for very little. It is simple to assemble and you can be moving trailers in less than 20 minutes of putting it together. The Yaheetech is not actually designed specifically for moving around a trailer but it works just as well. The main purpose is for use within holding heavy equipment such as welding tools but due to the weight capacity of 600 LBS and heavy duty construction, it makes for a great trailer dolly. Although it is not the regular trailer dolly design, it does a great job at moving trailers around. Simply putting the ball under the front of the trailer allows you to rotate the dolly up and move the cart around with ease. Moving your trailer around can require a fair amount of effort and a trailer dolly is the solution to making things far easier. They is the choice of a hand or electric trailer dolly but your budget may only stretch the to hand dolly. In short, the trailer dolly itself connect to the tongue of the trailer and allow you to move it around in any position you like. This prevents your back being under strain and makes positioning the trailer much easier. To help you make an informed buying decision, we have produced the below buying guide regarding trailer dollies. Attempting to pull round a trailer with or without a boat attached can be hard work. However, if you have a large vessel, you will require a boat trailer dolly that can handle the load with ease and be easy to pull using the handle. Most hand trailer dollies are capable of a 600 to 1,000 LBS load but if your vessel is larger, we strongly recommend opting for a motorized trailer dolly. Motorized trailer dollies such as the Trailer Valet can handle 10,000 LBS without breaking a sweat but it does come with an expensive price tag. The third wheel found on some trailer dollies often increases the weight capacity from the 600 region to above 1,000 LBS. How Does A Motorized Trailer Dolly Work? As you can see from the Trail Valet XL in action above, it uses a drill with a dedicated drill attachment for powering the chain drive system. This means that you no longer have to manually move the trailer dolly to move the trailer around. Rather than worrying about pulling the trailer, all you need to do is steering it in the right direction. Most come with multiple speeds to power the drive system, which provides additional control for maneuvering in tight spaces. Adjusting the hitch to the meet the trailer earlier without having to push the handle all the way down makes things much easier. Those finding themselves connecting to the trailer in different situations, especially on uneven grounds may find this feature very useful. When it comes to most motorized trailer dollies, they will be far smaller with a cover protecting the electrical mechanism. However, for the standard hand trailer dollies, the majority are constructed of a high quality steel for longevity. Due to the fact that these dollies may be subjected to the harsh marine environment, you will want to ensure that it has been powder coated. This will make it resistant to corrosion and reduce the need to wash any salt water from the steel. Not every trailer dolly will arrive pre-assembled for use straightaway. Therefore, it will require some assembly but most manufactures will provide detailed instructions on how to do this. There are very few parts required to build the dolly and it is a DIY tasks that pretty much anyone can do with basic tools. 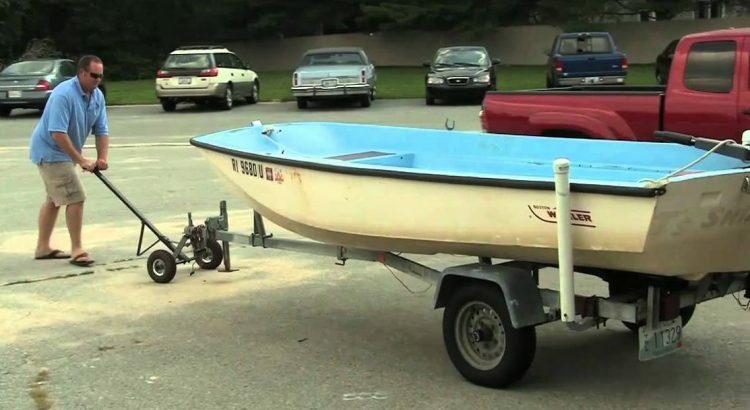 Investing into a quality trailer dolly for your boat is a worthwhile investment. Trying to manually move a 1,000 LBS boat trailer without one is hard work and causing unnecessary pain upon your back, which you will want to avoid. Within this article we have covered a wide range of boat trailer dollies that are suitable for all budgets. 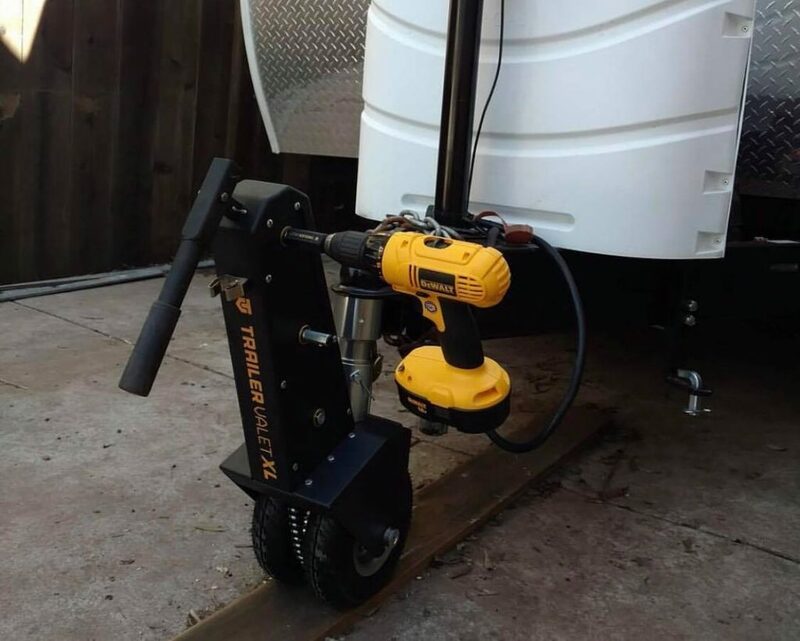 If you can afford a motorized trailer dolly, the Trailer Valet truly is remarkable and will transform the way you move your trailer. However, the cheaper alternatives will still do a great job at moving trailers within tight spaces. Hey Morgan. so looking at the various type of trailer dollies that are available I’m trying to decide which one will be able to handle my 22′ walk-around boat and trailer. Manufacturer dry weight is 2200 LBS and then I have to account for the trailer as well. Would these low cost dollies such as the Giantex and the TowTuff really handle this kind of weight without having to put an extra strain on your back? or would this type of weight require one of the more expensive battery powered dollies that says it can handle 5,000+ LBS. Please let me know your opinion. Hey Neisha – Manufacturer guidelines are only their to cover themselves really but I think the TowTuff will probably handle that amount of weight. Of course, it will be fairly tasking pulling that weight with a manual trailer dolly.